Test cattle identified through Genetic Animal Branding. Bright brands, huh? Newborn calves with your own brand already in place - that's right! Today's rapid advances in biotechnology have now made it possible. Dr. VaLynn Price Thompson, head geneticist at the University of Wyoming, is lending her expertise to an experimental research program for Genetic Animal Branding (GAB) in Sublette County. Dr. Thompson states that "research over the past decade has been successful in identifying and isolating the genes responsible for hair coloration in cattle. We've learned to manipulate genes of contrasting color and implant them into the DNA of a bull or cow. This has resulted in a permanent hair coloration displayed on the hip or rib cage of the animal. Our most exciting breakthrough came though when we found that the gene could be passed on to the parent's progeny!" 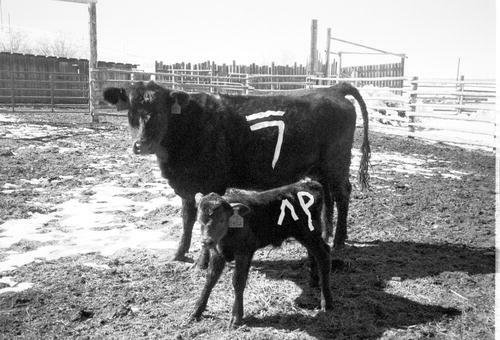 While either parent is capable of transmitting the owner's identification mark to its offspring, the bull or sire can spread the gene more efficiently throughout the herd. There are a number of advantages to GAB, but the most obvious one is that it would no longer be necessary to put the calves and their owners through the pain and stress of spring brandings.  People for the Ethical Treatment of Animals (PETA) has displayed cautious optimism over this new breakthrough. "We are anxious to spare our bovine friends unnecessary pain and suffering," said PETA, Friday, " but we withhold further judgment until such time as this is fully incorporated into the cattle industry." When local ranchers were asked for their opinion on GAB, LaBarge rancher, Myles McGinnis stated, "If this means we won't have any more brandings, I'm all for it. It's harder every year to get good help." Eddie Steele agreed. " I could use an extra day for other projects. There's never enough time." Those who have purebred cattle would enjoy another advantage. Sire to offspring GAB would ensure that the calf's sire is properly identified. Zac Roberts, who has a small herd of purebred Angus cattle, pointed out, "Now I have to check for the sire in my little black book with Mamma bellowing in my face. I could do without that!" There would also be a diminished chance for cattle rustling. Cattle thieves could not rework the original brand. "That would be a big asset for us," says Under Sheriff, Henry Schmidt. "All those hours spent in patrolling the Upper Green could be used instead to address other crimes and misdemeanors." "I can't imagine not having spring brandings," says Edna Swain, "Our whole family gathers to participate in the hard work and fun." "What if I want to sell one of my cows?" questioned Harry Steele. Will there be an antidote for the original marking or will the new owner have to rebrand with a hot iron?" Richard Hulen wanted to know if GAB would reduce the value of the hide for marketing. "What if the neighbor's bull jumps into my pasture?" asked Johnny Wardell. "Would I be able to erase the damage?" As Genetic Animal Branding is only in the test stages, there are still some bugs to work out. "Nevertheless," predicts Dr. Thompson, "by the year 2010 GAB will be used throughout the Western United States." Thompson also noted that they are currently working on modifying the DNA in cattle in order to produce cows uniquely suited to certain environments. With the reintroduction of wolves and the proliferation of grizzlies in Wyoming there is a potential demand for cattle tailored to resist such predators. In the not too distant future it is possible that cows could be armored with quills or dagger like horns. When asked for his input on cattle with built in defensive systems, Pinedale Veterinarian Vern Aultman declared emphatically, "All I can say is they'd better plan on getting someone else to preg test!"